Whether you are planning to have an intimate wedding or an exorbitant one, Palai Jyoti Banquets will surely match your unique choice, budget, and requirements. With a capacity of accommodating up to 200 in seating and 1000 in floating, the venue has a cosy and comfortable interior for the guests. It also offers an in-house team of caterers that puts all the efforts to delight the guests with mouth watering multi-cuisine dishes. Palai Jyoti Banquets, Kurla, Mumbai is an elegantly designed venue which can host up to a large number of people at an event. The pillared hall is classy and contemporary, done up in neutral greys and whites, complemented by floor-to-ceiling windows that flood the room with natural light, warmth and spaciousness. The venue is located just two minutes of arterial L.B.S. Marg, connecting the hall to all of Central Mumbai, and is also at a short distance from Kurla Railway Station. Pick Palai Jyoti Banquets for your engagement, wedding or a birthday party and their efficient team will help turn your vision into a reality. The venue serves alcohol and also allows you to get it from outside to please your guests. 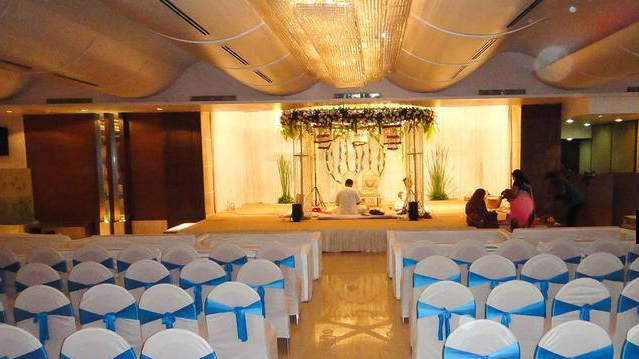 Palai Jyoti Banquets, Kurla, Mumbai offers complimentary changing rooms for the bride and the groom on their special day.